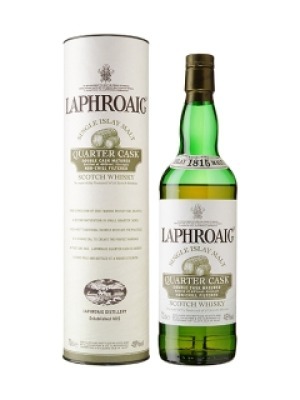 Laphroaig Quarter Cask Islay Malt Whisky is a popular Whisky available from TheDrinkShop in 70cl to buy online. Visit TheDrinkShop for the best price for 70cl of Laphroaig Quarter Cask Islay Malt Whisky or compare prices on our other Whisky products. For greater authenticity we simply barrier filtered the whisky - the method used in those far off days - and bottled at a higher alcoholic strength. The result surprised and delighted us. The additional oak influence creates a soft sweetness and velvety feel when first tasted, then the intense peatiness so unique to Laphroaig, comes bursting through. The finish is very long and alternates between the sweetness and the peat. Where to buy Laphroaig Quarter Cask Islay Malt Whisky ? Laphroaig Quarter Cask Islay Malt Whisky Supermarkets & Stockists. You can buy Laphroaig Quarter Cask Islay Malt Whisky online in most retailers and find it in the Whisky aisle in supermarkets but we found the best deals online for Laphroaig Quarter Cask Islay Malt Whisky in TheDrinkShop, DrinkSupermarket.com, and others. Compare the current price of Laphroaig Quarter Cask Islay Malt Whisky in 70cl size in the table of offers below. Simply click on the button to order Laphroaig Quarter Cask Islay Malt Whisky online now.